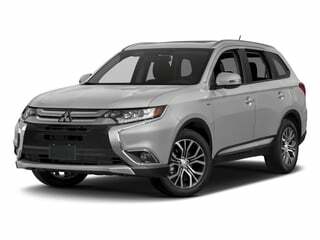 Be the first to review this 2018 Mitsubishi Outlander. It’s been a while since Mitsubishi had big news, so they are making the most out of the 2018 news, that there is a new plug-in hybrid electric vehicle (perfectly designated the PHEV). It’s the only plug-in-hybrid SUV in its class with all-wheel drive, and the only one with fast charging. And it can travel as much as 22 miles on electric power. So it brings together the environmental efficiency of an electric vehicle, the functionality of a crossover, and versatility of an all-weather vehicle with Mitsubishi’s S-AWC, or Super All-Wheel-Control. The standard DC Fast Charging capability can charge up to 80 percent capacity in 25 minutes, using a commercial station. At home with your 120-volt outlet it will fully charge in eight hours; or half that time with a 240-volt outlet. The new PHEV advances the technology of the Mitsubishi i-MiEV small electric car. It uses two high-output 60 kW electric motors mounted at the front and rear axles, to instantly send torque to all four wheels via S-AWC.. Its permanent magnet synchronous electric motor that drives the front axle is smaller, lighter and more powerful than that in the i-MiEV. The PHEV system in the Outlander was tested and developed at races like the Pikes Peak International Hill Climb in 2014 (prototypes placed first and second), and at the Baja Portalegre 500 off-road rally in 2015. The gasoline engine that supports the motors (or do they support the engine?) is an efficient 2.0-liter. The Outlander is known for bringing efficiency, comfort, and space, if not style and performance, for a lower price than the competition. It’s close in size to the Honda CR-V, Toyota RAV4, and Subaru Forester, but it feels roomier inside. It seats seven, with a small third row. This generation began in 2014, updated in 2016 with sleeker styling, better interior materials, more sound deadening, suspension changes to improve ride and handling, and a better-but-still-not-good-enough transmission. It got Apple Car Play and safety upgrades in 2017. For 2018 the base infotainment system is upgraded with a 7.0-inch touchscreen with Bluetooth connectivity. The base engine is a 166-horsepower, 2.4-liter four cylinder mated to a continuously variable automatic transmission that’s barely adequate. The Outlander GT features a 224-horsepower, 3.0-liter V-6, but it isn’t much faster than the four-cylinder. It accelerates from zero to sixty in about 8.0 seconds, slower than rivals. However it increases the towing capacity from 1500 to 3500 pounds, and has a pleasing exhaust note. Two all-wheel-drive systems are offered. The base Outlander ES gets a system with a locking center differential. Standard on the Outlander GT and optional on the other models is a system with an electronically controlled center coupling, an open rear differential, and an active front differential, but no low range. The EPA rates the Mitsubishi Outlander at 25/30 miles per gallon City/Highway, or 27 mpg Combined for the 2.4-liter with front-wheel drive, while all-wheel drive models with that engine are rated 24/29/26 mpg. That’s among the highest mileage vehicles with third-row seating. The GT, with V6 and all-wheel drive, gets 20/27/23 mpg, on Premium gasoline. On a fast drive over mountain roads, we got 21 mpg in the four-cylinder, and 20 mpg in the V6, both AWD. The Outlander gets top results in every category of the IIHS tests, to achieve the insurance industry agency’s Top Safety Pick+ status. From the NHTSA, it gets four stars overall for front-drive models and five stars with AWD. The 2018 Mitsubishi Outlander comes as the new PHEV, or as the old ES, SE, SEL and the V6 GT, with front- or all-wheel drive. The PHEV is priced at $34,595. Outlander ES ($23,945) comes standard with cloth upholstery, dual-zone automatic climate control, remote keyless entry, cruise control, steering-wheel audio controls, Bluetooth, six-speaker 140-watt audio system, 60/40-split folding second-row seats, 50/50-split third-row seats, power locks, windows, and mirrors; under-floor rear storage, rain-sensing wipers, leather-wrapped steering-wheel and shift knob, three 12-volt power outlets, USB port, 6.1-inch touchscreen HD radio, rearview camera, and 18-inch alloy wheels. Outlander ES S-AWC ($26,445) comes with all-wheel drive. Outlander SE ($24,9455) adds satellite radio, Apple Car Play, and Android Auto. It also comes with fog lamps, heated seats, and high-contrast instruments. Outlander SE S-AWC ($26,945) gets the upgraded all-wheel-drive. Outlander SEL ($26,145) upgrades with leather seating surfaces, remote power liftgate, and Rockford Fosgate Audio with satellite radio. The SEL also gets a power driver’s seat, power-folding mirrors, roof rails, gloss-black interior trim, an auto-dimming rearview mirror, and a universal garage door opener. Outlander SEL S-AWC ($28,145) gets all-wheel drive. Outlander GT 3.0 S-AWC ($32,245) gets the V6, the 710-watt, nine-speaker Rockford Fosgate audio system, the heated steering wheel, automatic LED headlights, LED fog lights. The GT Touring package adds the multi-view camera system, forward collision warning with emergency braking and pedestrian detection, lane-departure warnings, and adaptive cruise control. Options include a rear-seat DVD player, remote engine starting, and additional cargo solutions. Available safety features include lane-departure warnings, adaptive cruise control, forward collision warnings with automatic emergency braking and pedestrian detection. Those items can all be had together on the mid-range SEL, as can three new features: blind spot monitors, lane change assist, and rear cross traffic alerts. Mitsubishi designers call their shape Dynamic Shield. We call it generic reaching toward awkward. Those designers say the styling is derived from the look of the bumper-side protection that’s been on generations of the Montero SUV, which we recall as chrome trim shaped like fangs. Mitsubishi says the Outlander doesn’t have a bad angle. It’s no bad from profile, but they must not be looking at it from the front. The cabin is highly functional, and one of the quietest in the class, but it’s not exactly harmonious. The low instrument panel is simple and refreshingly straightforward; here aren’t a lot of buttons, and the layout and trims are spare. It’s understated, modest, warm, and accommodating. Although some might think it just plain. The interior materials are as good as those in competitors like Jeep Cherokee and Ford Escape. The driving position is excellent, with supportive front seats having lower cushions long enough for tall people. Unlike many crossovers in this class, the second row doesn’t feel flat and hard, and it’s comfortable enough for adults. But only a kid will ever want to climb back to the third row. Even large adolescents might be looking at their knees. The battery pack on the PHEV is located beneath the rear-seat subfloor, and doesn’t sacrifice any space or intrude into the passenger compartment. Both the second and third rows fold perfectly flat, creating a very useful cargo floor with a low load height. There are small side boxes just aft of the wheelwells, plus a small under-floor storage compartment that can hide a laptop. The Outlander isn’t intended to be sporty or engaging to drive, and it isn’t. It’s quite soft and detached from the road. But it’s easy and comfortable, a driver-friendly crossover that inspires confidence on that basis. It’s underpowered with the 2.4-liter, 166-horsepower engine, and the CVT is too slow to respond. It follows a logic that holds some ratios while accelerating, it’s indecisive on long grades, and barely adequate for this seven-passenger vehicle weighing 3500 pounds. Mitsubishi has worked on making this unit more responsive and quicker to adjust the ratio when passing, and the CVT aims to reduce some of the motor-boating feel that comes with many CVTs by holding onto ratios for a short time during acceleration. The net effect is that it while it seems at ease and effective in level, lower-speed use, it hunts around quite a bit on hills. Outlander GT models use a V6 making 224 horsepower; it’s considerably thirstier and needs premium fuel. To add to the disappointment, it doesn’t develop that much torque until you rev it. At least the paddle-shifters and 6-speed automatic enliven the driving a bit. With either engine and all-wheel drive, there’s an Eco Mode button that uses only front-wheel drive until there’s actual slip at the front wheels. The mode also softens throttle response and uses the air conditioning compressor more conservatively. The electric power steering is precise and rather firm, and perhaps a little too aggressively centered. The S-AWC manages Active Yaw Control (AYC), Anti-lock braking system (ABS) and Active Stability Control (ASC) with Traction Control (TCL).The driver can press the Twin-Motor 4WD LOCK button to simulate locking of a center differential and optimally distribute torque to all four wheels for improved traction and stability. The Outlander has more off-road ability than most other cars in its class. It’s worth noting Mitsubishi Motors was once a leader in rallying and in Paris-Dakar raids across the desert. Outlander’s AWD and suspension are fully up to the task of heading up most rugged gravel roads or two-tracks on the way to a trailhead. The available all-wheel drive in the ES is basic, with 2WD, 4WD, and Lock modes (the latter a locking center differential). All-wheel-drive SE and SEL models use a more advanced system; the GT comes standard with it. It uses an electronically controlled center coupling, combined with an open rear differential. This system also has a separate active front differential to help get the right torque split for the conditions, which helps power through some exceptional conditions, like when one wheel is on ice. The new PHEV uses an encased lithium-ion battery pack with 80 cells in series, to produce 300 volts and a high storage capacity of 12kWh. It’s perpetually charged by regenerative braking; even during deceleration without braking (coasting), the electric motors act as generators to send charging to the batteries. The driver can select the amount of regenerative braking by using the steering wheel paddle shifters to downshift the CVT. The PHEV automatically selects one of three drivetrain modes for optimal performance and efficiency. The EV Drive Mode uses all-electric power. The Series Hybrid Mode comes on when the energy remaining in the battery pack is low, or when acceleration is needed. It uses electric and gas power. In Parallel Hybrid Mode, the gas engine drives the front wheels, while the electric motors kick in for more power, such as on freeways or uphill. The driver can also select three modes himself or herself. There’s Eco Mode, Battery Save Mode, or Battery Charge Mode. The Mitsubishi Outlander is tried and true, but unexciting with weak powertrains. However the new PHEV is certainly worth looking at, if a plug-in hybrid crossover appeals to you.